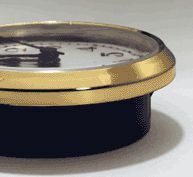 Maybe you would be interested in the Premium Quartz Clock Fit-Ups instead. We are proud of our F73 series fit-ups. In the past year many of our competitors have tried to increase their business by bringing in cheaply made imports. Our response was to invest in new tooling that would allow us to be competitive and create new models that are as versatile as they are attractive. This series is assembled in our own factory, so we control the quality, delivery and can even create custom dial designs faster than anyone else in the business. All of the F73 series feature this classic bevel edge bezel. Any of our 2 3/4 in. 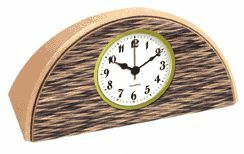 economy quartz clock fit-ups with the bevel edge bezel can be made with a bright gold or matte black finish bezel.